Hey everyone! 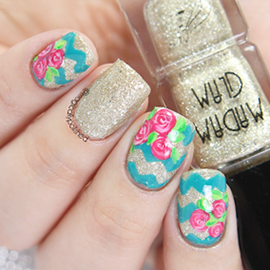 Nail wraps are now becoming a very popular outlet for so many people. They are just perfect for those laid back, lazy days. So I'm super excited to showcase a new nail wrap brand called Appliq. But these are not your simple nail wraps, nor are they sticker or vinyls. These are exclusively printed with real nail polish...YES! Which is why they are the next level nail art wraps out there! With tons of unique designs and patterns, even collaborations with the best artist out there (and not just nail artist). So you can imagine my excitement! The founder is by, non other than one of my top fave nail artist, Kelsey from Mani Meuse. I even quietly fan girled when I met her last years Kate Spade fashion show! :D I'm very excited with her new business venture, and these wraps are amazing! I will be splitting up post, as I want to show each nail wraps individually.This set is called Pearl Inlay collaborated by (another fave artist of mine) Kelly Base Coat -Top Coat. 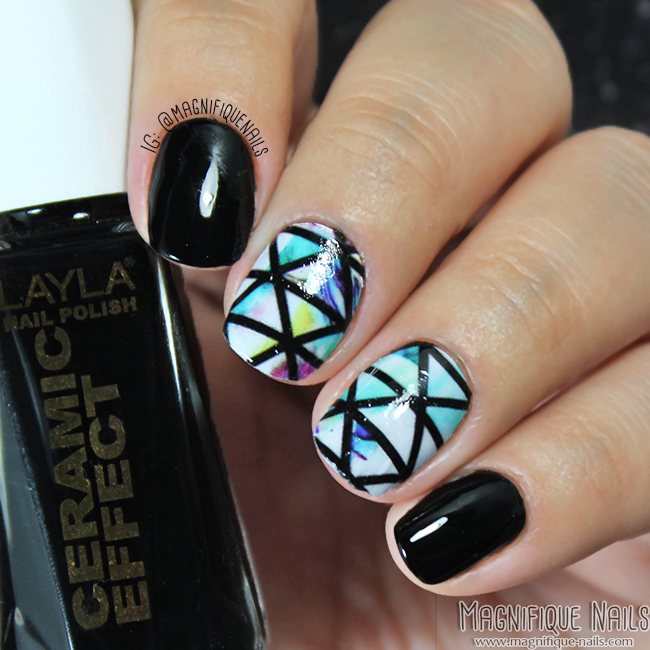 This design is very unique, with a geometric feel and stones in one. It comes with buffer/nail filer, a cuticle stick and of-course 16 wraps in a sealed package. I honestly can say I was excited and hesitant to try these, since I've had so many up and downs when it came to nail wraps. Some were perfect on application, however, they didn't like my top coat. The application were not that great, and yet, they loved my top coat. And some were in between, however, these were surprisingly incredible. 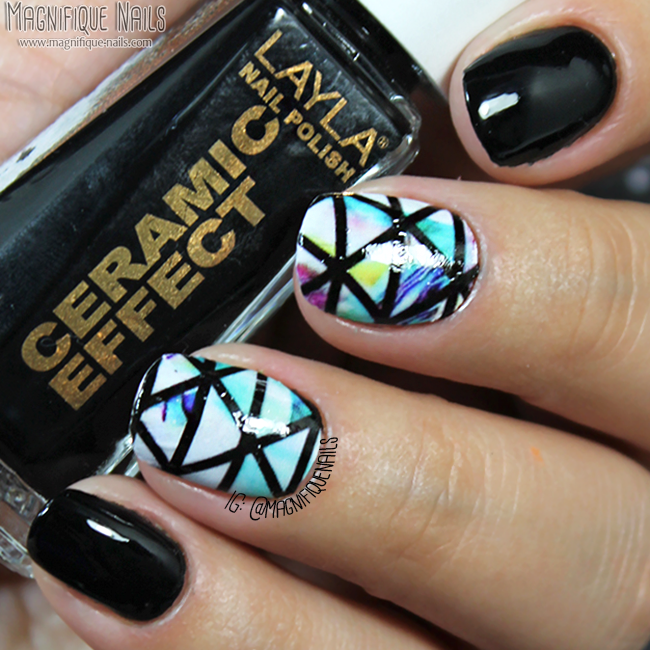 As for the application, the nail wraps were very easy to apply, especially following their how to tutorial! No need for a base coat (in my opinion), but it is optional. Now for the most anxious part of the process...the top coat (echo)! As suggest from their site you can apply gel top coat for a long lasting wear. Which I applied on my thumb, I used ASP Soak Off Gel Polish Top Coat (which you can purchase in Sally Beauty). However if you do not have gel top coat, I did apply regular top coat on two of the nails. I used K B Shimmer Top Coat (which I found are best for nail wraps). As I applied the top coat, I didn't noticed any shrinkage or wrinkles, even the one with the gel top coat. I even wore the wraps all night, and was pleasantly happy how well they lasted without any peeling on the tips or around the cuticles. Overall, I am loving this design and this set. Most of all I was surprised how long they lasted. I have been wearing the wraps for the past three days and they were withstanding (with only a few simple tears here and there). Especially with the gel top coat, which lasted a total 4-5 days on my thumb. I can't wait to try the next sets I received!